orbits (e-0),-asingle angle, u = to+ v, can replace the argument of perigee and true anomaly. This angle is the argument of latitude and, when e = 0, equals the angle from the nodal vector to the satellite position vector. Finally, if the orbit is circular and equatorial, then a single angle, /, or true longitude, specifies the angle between the X-axis and the satellite position vector. As defined in Chap. 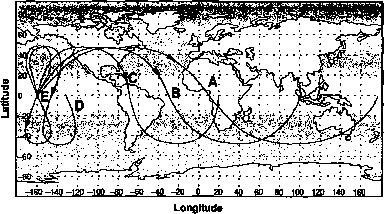 5, a satellite's ground track is the trace of the points formed by the intersection of the satellite's position vector with the Garth's surface. In this section we will evaluate ground tracks using a flat map of the Earth. Chapters 5 and 7 give another approach of displaying them on a global representation. •This convenient empirical definition does not apply for near polar orbits. More formally, a prograde or direct orbit has i < 90 deg. A retrograde orbit has i >90 deg. A polar orbit has i = 90 deg. (For a more precise rotation rate for the Earth, use 3.988 min/deg instead of 4.0 in these equations.) where AL is the change in longitude in degrees that the satellite goes through between successive ascending nodes. The difference in longitude between two successive ascending nodes for a direct orbit will always be less than 360 deg, and in fact, will be negative for orbits at altitudes higher than geosynchronous altitude. For retrograde orbits, the difference in longitude between two successive ascending nodes (positive change is measured to the west) is always greater than 360 deg. Fig. 6-4. Orbital Ground Tracks of Circular Orbits of Different Periods. (A) AL = 335°, P= 100 min; (B) AL = 260°, P= 398 mln; (C) AL = 180°, P= 718 mln; (D) At = 28°, P= 1,324 min; and (E) AL = 0°, P = 1,436 min. s 331.249 15 Pm km where the period is in minutes. Figure 6-4 shows one revolution each for the ground tracks of several orbits with an increasing semimajor axis. 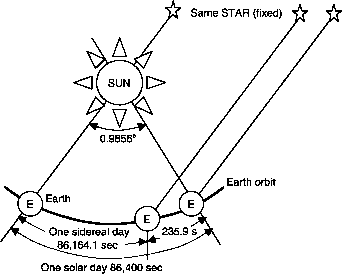 The period of a geosynchronous orbit, E, is 1,436 min, matching the Earth's rotational motion. We can determine the oibit's inclination by the ground track's maximum latitude. For direct orbits the inclination equals the ground track's maximum latitude, and for retrograde orbits the inclination equals 180 deg minus the ground track's maximum latitude. The orbit is circular if a ground track is symmetrical about both the equator and a line of longitude extending downward from die ground track's maximum latitude. All the oibits in Fig. 6-4 are circular. D: Molniya orbits, a = 26,600 km, e = 0.75, i = 63.4 deg, a> = 270 deg.